BILLINGS - An early morning house fire Wednesday in Lockwood left Carolyn Kuneff and her husband with a nearly destroyed home and a lot of heartbreak after losing their dog in the blaze. The couple is now trying to pick up the pieces of what remains of their home. Carolyn Kuneff said even though losing her home and her beloved pet has been very difficult, she is grateful for the bravery of her dog, Nikki. "We were asleep and at about 2:30 she started barking," Kuneff said. "She was downstairs at the time. My husband woke up, and he saw the glow of the flames from our bedroom window, and he told me we're on fire." "I actually saw my dog run into the house through the flames to get my husband out. She made sure that we were safe, that I was safe, that I was out of the house. She knew that he was back in the house, and she actually ran through the flames to get him." Kuneff's husband Rudy made it out of the blaze, but Nikki, the family dog, did not. 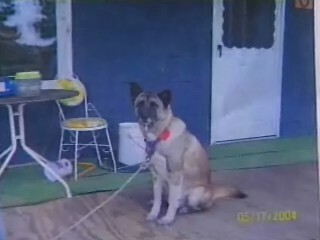 The purebred Akita died of smoke inhalation. "Akitas are known in Japan. They were originally bred to show the samurais what bravery meant," Kuneff said. For Kuneff, losing Nikki was much more than just losing a pet. "I'll definitely miss Nikki, but she is definitely a hero in my heart," Kuneff said. "You can't replace something like that. It's like losing your very best friend."